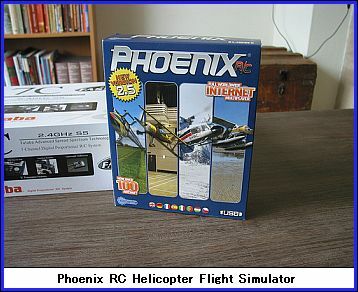 The very popular RC Helicopter Simulator is the safest way to learn how to fly your new RC helicopter. With the RC helicopter flight simulator you can learn all flying techniques from hover to 3D flight. There are different levels of training from beginner to a highly skilled pilot. Hire an instructor to assist you with your training, go on a combat run with one other opponent or form your own squadron and clear up the skies. Fly different types of helicopter as well as airplanes in various parts of the world. Join other pilots and fly around the world. Create planned flights from heliport to heliport, country to country. Perform stunts as you fly using the included DX5e 2.4GHz DSM® transmitter. This is the very same transmitter that real radio controlled flight enthusiasts use. When you are ready to take to the skies you can use the very same DX5e to fly your real helicopter which you have been practicing with. The DX5e’s advanced 2.4GHz DSM technology lets you fly without any interference and frequency conflicts from other Radio Controlled pilots. These helicopter simulators are high performance, high realism with excellent sound effects. You can also download new sceneries when the old ones become a bit tired. Now there is no need to worry about crashing your helicopter on your very first flight or it flying away from you never to be found again (as has happened to me). There are a number of different Helicopter Flight Simulators available. If you are serious about learning to fly RC, I would recommend purchasing only quality products. Compatible with Windows Vista, XP and Windows 7. Return from RC Helicopter Simulator to Radio Control Airplane Shop.